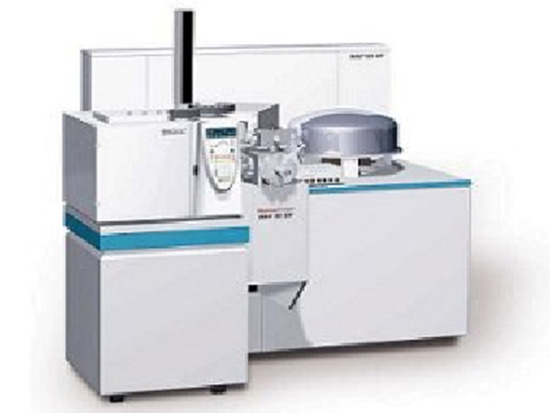 Benchtop orthogonal acceleration time-of-flight (oa-TOF) mass spectrometer. Source and Probe options: EI, CI, DCI, FI, FD and DIP. High resolution double focussing (BE) mass spectrometer EI, CI, LSIMS, ESI and APCI capability. 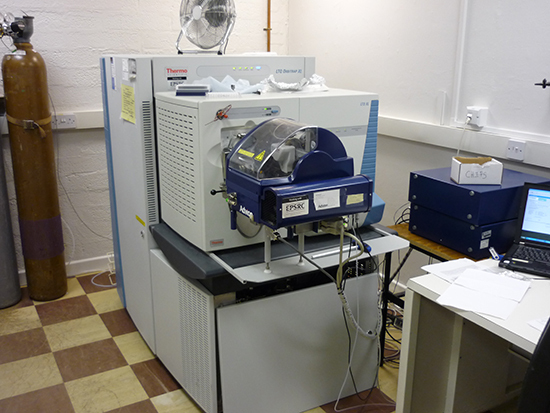 Installed in 2002, MALDI-TOF with Linear and Reflectron analysers. 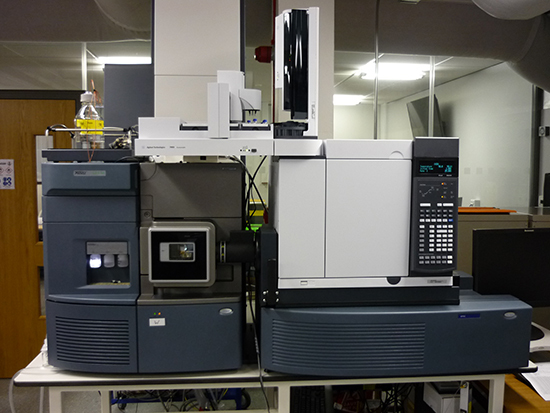 Low resolution GC-MS instrument installed in 2008; EI, CI+, CI- capability. 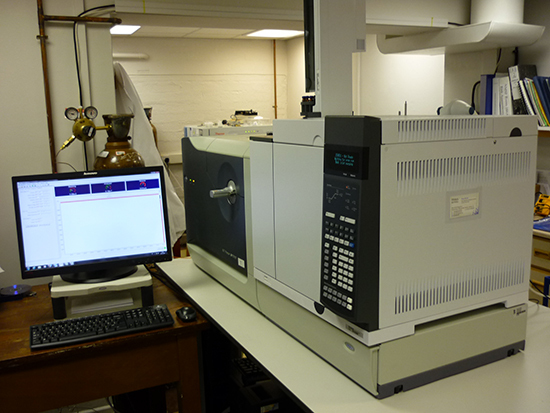 Coupled to a Trace GC Ultra Gas Chromatograph with Tri-plus auto-sampler. Mass Accuracy: <3 ppm RMS with external calibration; <2 ppm RMS with internal calibration. The TM-Sprayer™ Tissue MALDI Sample Preparation System is designed to provide the highest quality matrix deposition on the two-dimensional biological samples. 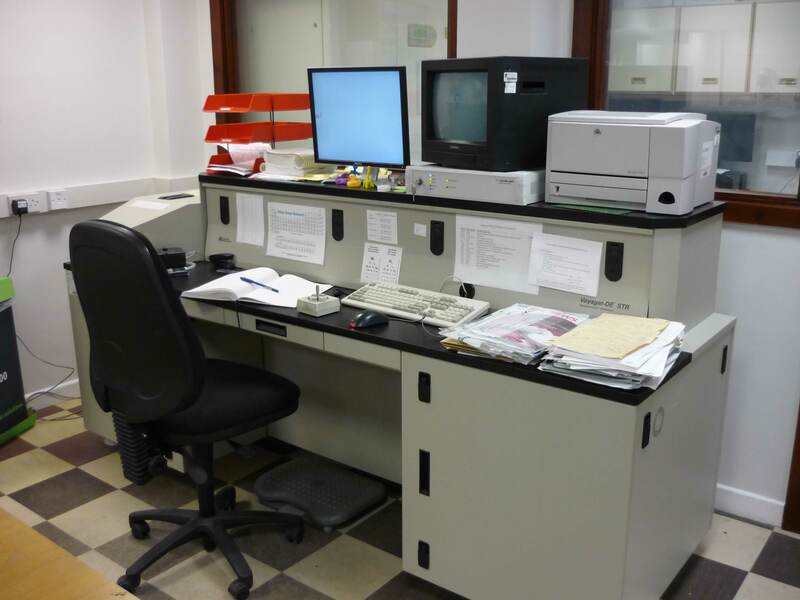 EI and CI analyses are generally performed on the DSQ-Trace GC-MS quadrupole instrument or MAT95 magnetic sector. 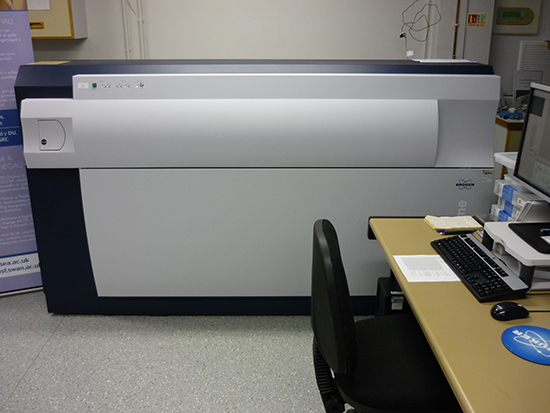 The DSQ-Trace GC-MS is used for volatile samples and mixtures, and the MAT95 is used for less volatile compounds, for metal-containing species, and when there are special sample requirements, e.g. air sensitive or insoluble samples. EI: Source temperature 200°C; electron energy 70eV; mass range m/z 33-650 unless higher is requested. CI: vary with application - available on request; mass range m/z 33-650 unless higher is requested. Solids probe or desorption probe may be used, with manually controlled heating rates. CI+ or CI-: source temperature 120°C to 160°C; mass range as required by analyte; ammonia or methane reagent gas. Accurate mass Electron Ionisation (EI) and Chemical Ionisation	(CI) measurements, in positive ionisation mode, are obtained on the MAT95 by "peak matching", with mass resolution between 8000 and 10 000 (10% valley definition). For EI, Heptacosa (perfluorotributylamine) is the usual reference compound for accurate mass measurement, and for CI, PEG (polyethyleneglycol) is usually used. If a different reference compound is used, it will be specified in an attachment to the result. Precision of the method is better than 5ppm and nearly always within 3ppm. Usual mass range is 50 to 1000Da but higher is possible; measurements of molecular masses over 1000Da are usually discouraged as being a meaningless exercise. 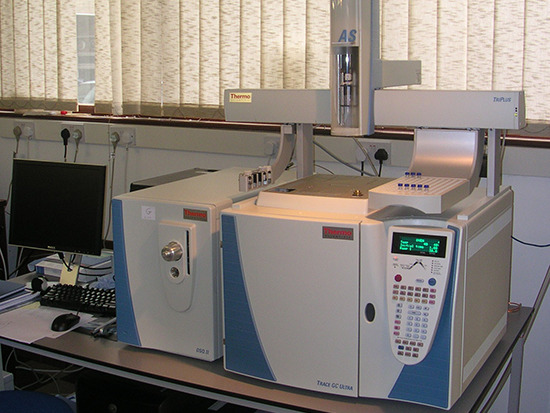 EI electron energy 70eV; either the water-cooled or desorption probe is used, as required; source temperature depends on sample. CI source temperature ca. 140°C and electron energy 50eV; either the water-cooled or desorption probe is used, as required. Note re "FAB" (LSIMS): this service continues to be offered but is being replaced by other ionisation modes as far as possible. "FAB"(actually LSIMS) analyses, in positive or negative ionisation mode, up to mass ca. 3000 Daltons, are performed on the MAT95. Caesium ion bombardment is used at 18-22 kV energy on to the sample dissolved in a matrix liquid, usually 3-nitrobenzyl alcohol (NOBA). Resolution is sample dependant, and at least 400 greater than the maximum mass (10% valley definition). FAB is undesirable for compounds of molecular weight less than 250Da, as the matrix ions dominate this region. Accurate mass "FAB" (LSIMS) is performed on the MAT95 in positive and negative ionisation mode. Measurements are performed by "peak matching" at resolution 8000 (10% valley definition). Precision of the method is better than 5ppm. Mass range m/z 150 to 1400, although measurements of molecular masses over 1000Da are usually discouraged as being a meaningless exercise. Glycerol/CsI is the usual reference compound. If a different reference compound is used, it will be specified in an attachment to the result. ESI analyses are generally performed on the Orbitrap XL using nanoelectrospray. Printouts will clearly state on the top whether nanoelectrospray or pneumatically-assisted electrospray has been used (see both methods below). The spectra achieved by both methods are similar; only the inlet and rate of sample consumption differ. For both spray rates, different source ("cone") voltages may be used to either promote molecular fragmentation ("harder" ionisation) or to minimise it and promote multiple charging ("softer" ionisation). Spectra are labelled appropriately when different source voltages give different results. Electrospray data acquired on the Orbtirap to m/z 2000 are generally also "accurate mass measurements" (5 ppm guaranteed; usually better than 3ppm). Nanospray: analyses are performed on the Orbitrap XL in positive or negative ionisation mode (one polarity per analysis). The Advion NanoMate inlet is used with a 96-well plate, corresponding transfer tips and 400-nozzle spray-chip. (With this inlet, each sample uses its own well, sample tip and nozzle, effectively eliminating the "memory" problem that is common with standard electrospray.) Solvents and additives used are listed on the results. Orbitrap XL conditions: see SOP document. 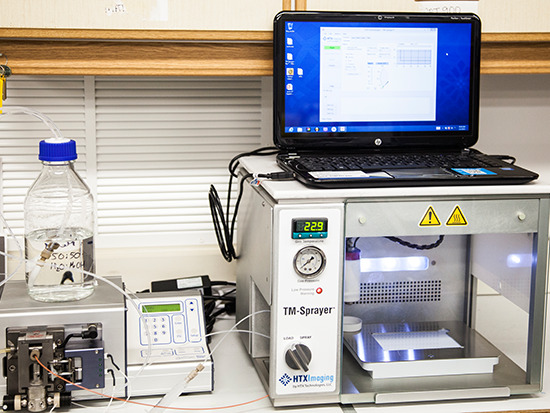 Electrospray: analyses are performed on the Orbitrap XL in positive or negative ionisation mode. Samples are loop injected into or infused in a stream of water / methanol (1:1 at 50µL/min.) using the customer-specified solvent for dissolution. Nebulisation is pneumatically assisted by a flow of nitrogen through a sheath around the capillary, a process sometimes referred to as "Ion spray". See Orbitrap SOP for more information on this instrument. Orbitrap XL conditions: see SOP document. Accurate mass Electrospray (ESI) is the preferred laboratory method and is attempted for all compounds submitted for accurate mass. Other techniques will only be used if ESI fails. If both a full-scan characterisation and accurate mass are required, both are done simultaneously on the Orbitrap XL. If only a single ion accurate mass measurement is required, it may be performed on the Orbitrap XL or on the Xevo G2S in positive or negative ionisation. Orbitrap XL conditions: see SOP document. Standard operation uses nanoelectrospray on the Advion TriVersa NanoMate. 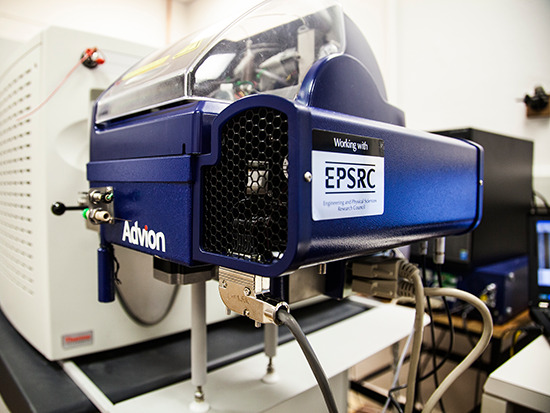 APCI in this laboratory is performed on the Orbitrap XL and on the Xevo G2S using the Atmospheric Solids Analysis Probe (ASAP) to insert samples into the APCI source. (Traditional flow injection APCI is also available but is rarely required). Samples are deposited onto a glass capillary as a solid or in solution. Additives such as ammonium acetate may also be used on the probe or in the ion source, to assist ionisation. Atmospheric Solids Analysis Probe (ASAP) conditions: Source Temp. : sample dependent. If the vapourizing temperature is unknown, the sample is introduced at ambient temperature (circa 40ºC) then the temperature is increased until the sample vaporizes. Accurate Mass APCI is also carried out using ASAP under the above conditions. For instrument calibration, please see Orbitrap SOP document (instrument is calibrated using ESI). Accurate mass is obtained on all ions in the spectrum simultaneously. APCI by direct infusion is available upon request. MALDI is performed on Applied BioSystems Voyager DE-STR and Bruker ultrafleXtreme mass spectrometers. A typical procedure involves mixing solutions of sample and matrix, and pipetting 0.5-1 microlitre onto the target well of a sample plate. Inorganic salts are sometimes added to promote ionization. The sample spot is dried, allowing co-crystallisation of the mixture, then irradiated with a pulsed N2 laser ( 337nm, f = 3 or 20Hz). Solvent-free preparations can also be used. The matrix is ablated from the plate while the sample is simultaneously desorbed and ionised, then accelerated into a flight tube (typically 20kV). The instrument may be run in any combination of positive or negative and linear or reflector modes. Specific details regarding conditions will accompany results. Using the service - more information about services available for different analytes (including polymer details). Biochemicals - recommended sample clean-up procedures. GC conditions: DSQ: PTV injector, column: WCOT TR5MS 25m x 0.25mm with 0.25μm film. MS conditions: EI: Source temperature 200°C; electron energy 70eV; mass range m/z 33-650 unless higher is requested. MS conditions: CI: vary with application - available on request; mass range m/z 33-650 unless higher is requested. LC-MS may be performed on the Orbitrap only by special arrangement with the Facility, on a collaborative basis. Please contact the Facility Manager for details.